Jasper Cabochon (Noreena Jasper from Australia - 42mmx32mmx8 mm) is hand beaded with TOHO 11/0 seed beeds (matte maroon/bronzed gold) and Hematite cubes (2mm). 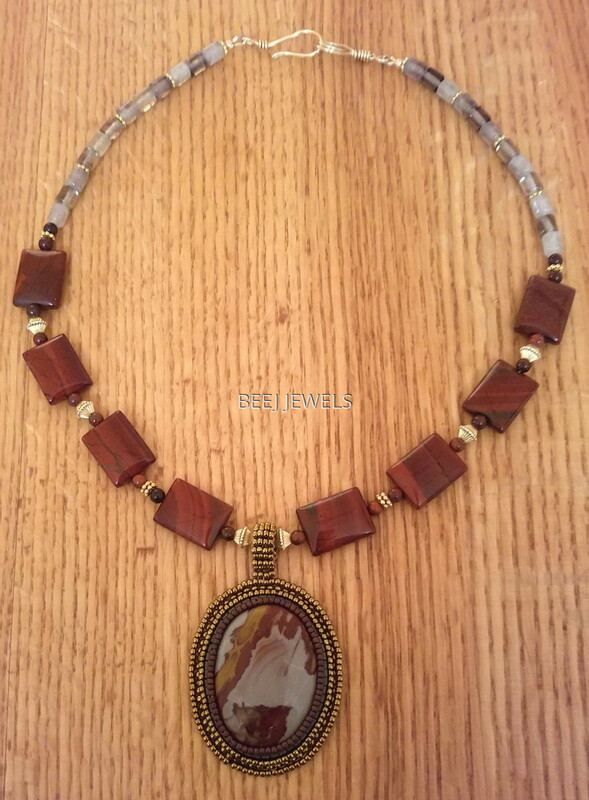 It is backed with beige Ultrasuede and connected to necklace with a bronzed gold seed beed bail. The Ultrasuede is treated with DRx Beasley's microsuede protection to prevent staining. Necklace is made with Apple Jasper rectangular beads (15mmx20mm), Apple Jasper round beads (4mm), green moss Quartz barrels (7x6mm), YGF (yellow gold filled) corrugated beads (5x7mm) and YGF spacers. Double Hook & Eye clasp is hand formed with YGF 18 G wire. Length of necklace including clasp is 20-1/2".